In this article we utilize a (posthumanist) practice theory orientation to foreground the neglected role of material elements (e.g., objects and spaces) in institutional work. The paper builds on the results of an empirical study of two prizes in the Italian public sector for best practices in public administration and healthcare respectively. Our discussion centres on the critical role played by materiality in the legitimizing work performed by the two prizes. More specifically, we show that humans and material elements share the institutional work of mimicry, theorizing, educating, and reconfiguring normative networks. The article expands and enriches the notion of institutional work by foregrounding its inherent heterogeneous nature. It also shows the capacity of post-humanist and practice oriented approaches to shed new light on fundamental questions regarding the nature of situated action and distributed effort in institutional analysis. 4. What Do Students Think of Social Media in the Classroom? Recent research has discussed the opportunities associated with the use of social media tools in the classroom, but has not examined the perceptions students themselves hold about its usefulness in enhancing their educational experience. This research explores students’ perceptions of social media as an effective pedagogical tool. Undergraduate students in a midsized, private university taking a marketing course were surveyed about their social media usage and preferences as well as their perceptions regarding the use of social media in higher education. Additional qualitative data collection with students probed into motivations for social media use in education as well as instructor and university perceptions. Findings reveal openness to using social media in education, uncover interactive and information motives for its use, and offer theoretical and pedagogical implications. Importantly, we offer insights into how educators can strategically incorporate social media tools into the classroom as well as how the use of social media can potentially affect students’ views of the instructor and the university. Organizational research is guided by standards of what journals will publish and what gets rewarded in scholarly careers. This system can promote novelty rather than truth and impact rather than coherence. The advent of big data, combined with our current system of scholarly career incentives, is likely to yield a high volume of novel papers with sophisticated econometrics and no obvious prospect of cumulative knowledge development. 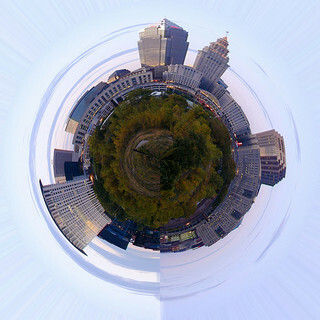 Moreover, changes in the world of organizations are not being met with changes in how and for whom organizational research is done. It is time for a dialogue on who and what organizational research is for and how that should shape our practice. In attending the 2010 “Convergence: Managing + Designing” workshop at the Weatherhead School of Management at Case Western Reserve University, we were struck with a particular question. Isn’t “managing as designing” (or “design thinking” for some folks) simply all about aesthetics? If so, what does this mean for managers and their organizations? In researching for this essay, we were struck by the mix of opinions and research on how well managers and organizational systems could rely on “design” and using non-rational forms of problem-solving. More recent thinking has suggested that organizations today really need to incorporate novel, less-familiar ways of defining and generating solutions for problems. But there are also arguments that the management education and the reward systems in organizations are all set up to focus on rationally getting to the bottom-line through selecting from pre-determined options. Also, even though design thinking seems to be a pretty popular way to approach problems in organizations these days, it still hasn’t been defined clearly, and is still limited to only a few key adopters. We tried to take in all perspectives saying that 1) we agree that new ways of seeing problems and their impacts are needed 2) using art-based forms of defining problems and generating solutions provides insight into things that are usually hard to see and talk about 3) this relies on aesthetic knowledge – or the ‘feel’ of a problem for the people involved – and therefore on engaging our bodily senses and 4) not very many organizations are set up to draw on this kind of knowledge based in what we see, hear, touch, smell, and even taste. The scholarly reference (1) gives credit to the original source of materials used and (2) provides evidence of the depth and breadth of scholarly work, via the materials reviewed, integrated, and synthesized to form the basis of the research. 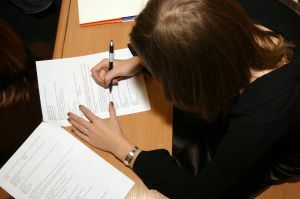 The reference list of a manuscript reflects the authors’ due diligence in exploring and understanding the research topic. To situate its contribution, a scientific text must establish a context and convey to readers the extent and nature of its relationship to the existing literature. References are the means to establish this context and the nature of contribution (Locke & Golden-Biddle, 1997). References, then, serve as a critical component of the scholarly article, worthy of careful time and attention by authors, and careful review and evaluation by reviewers and readers. The goal of this editorial is to provide a thought-provoking discussion of references in the scholarly manuscript and identifying key points to be considered in selecting and presenting references for publication in family business and other areas in management and organizational research. To celebrate the new year, all five articles will be open for the next two weeks. Happy New Year from Management INK! This morning saw the start of the Marketing Educators Association 2015 Conference in Las Vegas, Nevada! MEA is the premier international organization devoted to advancing the practice and scholarship of marketing education. The organization’s mission is to provide worldwide leadership in promoting the development and sharing of scholarship that enhances marketing education and advances marketing knowledge and practice. In honor of this annual conference, we are pleased to bring you the top five most read articles from Journal of Marketing Education. “Social Learning Theory: A Multicultural Study of Influences on Ethical Behavior” by Richard C. Hanna, Victoria L. Crittenden, and William F. Crittenden from April 2013. “Self-Directed Learning: A Tool for Lifelong Learning” by Stefanie L. Boyer, Diane R. Edmondson, Andrew B. Artis, and David Fleming from April 2014. “Together We Innovate: Cross-Cultural Teamwork Through Virtual Platforms” by Rikke Duus and Muditha Cooray from December 2014. “Assessing Teamwork Skills for Assurance of Learning Using CATME Team Tools” by Misty L. Loughry, Matthew W. Ohland, and David J. Woehr from April 2014. Want to know about all the latest news and research like this from Journal of Marketing Education? Click here to sign up for e-alerts! Do You Have Research on Marketing Education? 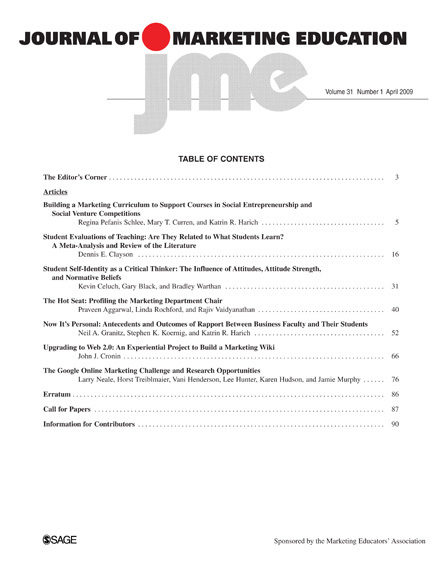 Journal of Marketing Education provides a forum for the exchange of ideas, information, and experiences related to educating students of marketing and advertising. It is the leading peer-reviewed, international scholarly journal publishing articles on the latest techniques in marketing education, emphasizing new course content and effective teaching methods. It also addresses professional issues, including development of the curriculum, career development, and the state of the profession. Click here to get more information on submitting to Journal of Marketing Education! Interested in keeping up on all the latest research from Journal of Marketing Education? You can click here to sign up for e-alerts and get new article notifications sent directly to your inbox! Read Journal of Marketing Education’s Special Issue on Sales Education and Training for Free! What factors influence undergraduate business students’ decision to pursue sales education? What’s the role of self-efficacy in sales education? Can an interactive computer simulation teach students sales ethics? Journal of Marketing Education‘s Special Issue on Sales Education and Training explores these topics and more! Welcome to this Journal of Marketing Education (JME) Special Issue on Sales Education and Training. We proposed this Special Issue as demand for college graduates with a sales degree/major/minor/emphasis/interest continues to escalate. In addition to being the most common career entry point for marketing students, a 2010 Georgetown University study found that sales is a top-ranked career for a number of disciplines outside of marketing. Interestingly, sales ranked second for students majoring in general business, economics, international business, and management. Sales ranked third for students majoring in finance, operations management, HR, and management information systems. Across campus, sales ranked second/third for students in the social, natural, and physical sciences and in liberal arts and communications. While the demand for graduates to work in sales grows, there is a shortage of scholarly articles dealing specifically with sales curricula and sales pedagogy. In fact, the marketing education literature has been relatively slow in responding to changes in sales education and training. Of the over 800 articles published in JME’s history, only 27 papers deal with sales education (see Gray et al., 2012). The absence of research in sales education is not due to a lack of activity or paucity of scholars in this area. According to DePaul’s Universities and Colleges Sales Education Landscape Survey, sales curricula grew from 44 U.S. programs in 2007 to 101 programs in 2011. As demand for sales-ready graduates grows, universities are trying to meet this demand by expanding curricular offerings, opening sales centers, and hiring sales faculty. We initiated this Special Issue with a goal of engaging scholars in this area and sparking additional research. Journal of Marketing Education‘s Special Issue on Sales Education and Training includes sections focusing on recruiting and developing the student mindset, self efficacy and sales, and the classroom and teaching tools. Click here to access the table of contents and read the articles for free for the next 30 days! Make sure to click here to sign up for e-alerts and be notified about all the latest research from Journal of Marketing Education! Trying to Improve Marketing Education? An increase from four to six exams per semester improves student performance and teacher evaluations. 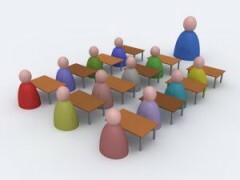 A long class format (3-hour class once a week) is associated with lower student learning than are shorter formats. A game improves actual and perceived learning of specific marketing content. Team testing improves perceived learning but not actual learning. Using humorous anecdotes has positive effects on learning. Click here to view the entire collection from the Journal of Marketing Education. Want to know about all the new articles from the Journal of Marketing Education? Click here to sign up for e-alerts! Do you have a paper to submit? The Journal of Marketing Education is now accepting research on ethics, corporate social responsibility, sustainability and numerous other topics, welcoming cross-functional submissions about educating our future business leaders. The Journal of Marketing Education (JME) is the leading international scholarly journal devoted to contemporary issues in marketing education. Its mission is to provide a forum for the exchange of ideas, information, and experiences related to the process of educating students in marketing and its subfields. Its audience is largely composed of marketing faculty members at institutions of higher education where teaching is an integral component of their overall responsibilities. The main function of the Journal of Marketing Education is to publish articles focusing on the latest teaching/learning strategies and tactics in marketing education. JME also publishes articles that address various professional issues of importance to marketing faculty members. The journal’s readership is international in scope with significant representation in university libraries. JME also plans to publish a special issue on ethics, corporate social responsibility, and sustainability in marketing education, with guest editors Victoria Crittenden and Linda Ferrell. The deadline for submissions is November 1, 2012. Please visit jmd.sagepub.com to view the special issue call for papers. JME also plans to publish a special issue on ethics, corporate social responsibility, and sustainability in marketing education, with guest editors Victoria Crittenden and Linda Ferrell. The deadline for submissions is November 1, 2012. Please click here to view the special issue call for papers. Manuscripts should be submitted electronically to the Editor, Donald R. Bacon, at mc.manuscriptcentral.com/jmed. Authors are expected to review and conform with manuscript submission guidelines described here prior to making a submission. Questions about the submission process should be forwarded to the Editor at dbacon@du.edu.